Our program is a NO-SORT RECYCLING program. Simply place all your acceptable recycling materials into the recycling cart. Recycling will be picked up monthly. Please click on the Check Pickup Schedule for your recycling day. Place one cart on each side of the driveway or at least 5 feet apart. To ensure pickup, carts must be out by 5:30 a.m. or the night before your pickup day. We provide monthly recycling in Duluth outlying townships. (not available in all areas). Included in the cost of trash pickup. Place all material loose in cart. If you store your recyclables in a paper/plastic bag, please dump all recyclables from bag in to cart. Paper bags can be tossed in cart. Plastic bags will not be accepted, place in trash. Shredded paper must be paper bagged and placed in cart. Don’t put our employees lives in danger. Dispose of medical sharps/needles properly. Place in a puncture resistant container, such as a detergent bottle or plastic soda bottle with a screw top lid. Deliver to the WLSSD Household Hazardous Waste Facility. 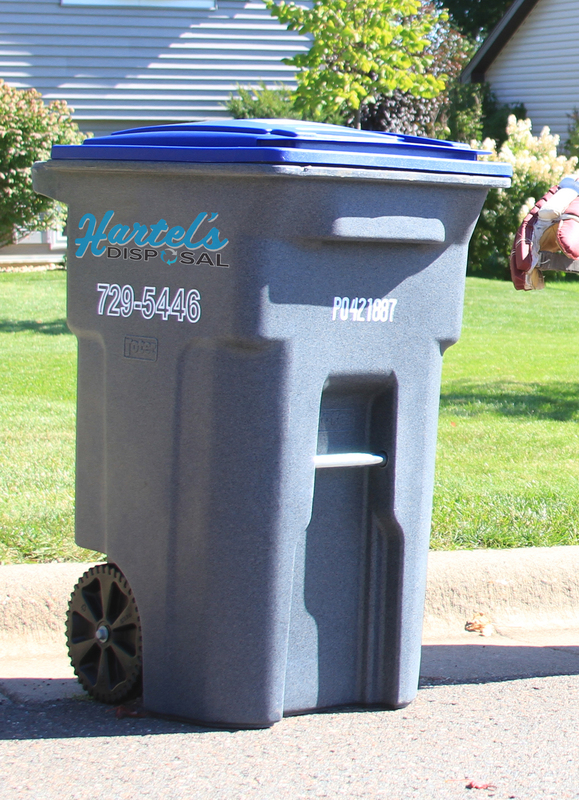 Hartel’s / DBJ Disposal does NOT ACCEPT these items. Newspaper (including all inserts), magazines, catalogs, telephone books, office/computer paper, shredded paper, envelopes, mail, chipboard/paperboard (like cereal boxes) and corrugated cardboard. Please place in PAPER BAG. If cardboard does not fit in recycling cart, cut into 2' x 2' pieces, flatten and place next to the cart. Bottles and containers with #1 through #7 on the bottom (discard pumps). NO PLASTIC BAGS will be accepted, they cannot be recycled at our facility. They can be dropped off at most local supermarkets for recycling. Bottles and jars, clear, brown, and green colors are accepted (remove caps and lids). NO BROKEN GLASS will be accepted. Tin and aluminum are recyclable, as well as empty aerosol cans (please remove plastic tips). NO SCRAP METAL will be accepted. NOTE: All items MUST BE RINSED CLEAN for recycling. DON’T BE GUILTY OF “WISH CYCLING.” RECYCLE WITH CERTAINTY. The materials other than listed above cause problems for our processing machines and ultimately end up compromising the NO-SORT recycling system.